A well-organised and highly structured classroom minimises the impact of cognitive demands to process and interpret new information. Justine Henderson, Learning Support Coordinator at Berhampore School, explains how the classroom layout is used flexibly to respond to the varying needs of all students. Set up your environment to minimise students' cognitive load. Providing support for students' specific needs enables them to work more independently. A consistent routine supports independence and reduces anxiety and stress. 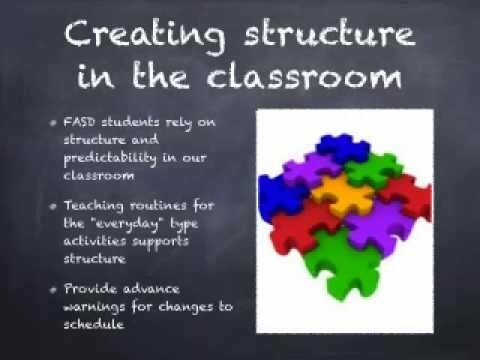 Minimise auditory and visual distractions to help diminish the confusion and frustration many students with FASD experience, and maximise their ability to focus on the task at hand. Strategically place the student’s seat away from distractions, such as doorways and windows. Clear the student’s desk of everything, except the lesson at hand. Put away (or out of view) teacher’s equipment and books competing for a student’s attention. Seat student closest to where you present information. Seat student next to students who do not distract others. Provide nonverbal cues that are familiar to the student to help them stay focused and working quietly, for example: use hand signals, move close to student. Create quiet spots in your classroom. Develop a class treaty/norms/rules with the students. Agree on 3–4 positively stated rules. Review rules regularly with the class. Use consistent vocabulary when teaching and reinforcing rules. Apply agreed consequences immediately when behaviour expectations are not met.